Boxing loves a comeback, the high drama of the scarred and weary warrior clambering through the ropes in a bid to win back his crown. Wiser in life but older in body, desperately trying to wind back the clock. At stake? The chance to be the champ or the risk of being the chump. There is nothing in between. It is no wonder that Hollywood loves the ring. The latest in line is the British fighter Ricky Hatton, the former WBA (Super), IBF and IBO light welterweight champion and WBA welterweight champion. Already 33, beaten to a pulp by Manny Pacquaio in his last fight three years ago, it really doesn’t make sense. The Mancunian, though, is immensely popular and any fight that does go ahead is sure to put bums on seats and make a few bob through the broadcasters. Will it matter who else is in the ring with him? Some names are already being bandied about for the November bout, the favourite being the all-action Greek-Australian Michael Katsidis. Katsidis is almost the same age as Hatton, he is 32 now, but he is one of those fighters who has operated around the fringes of the very best. Yes, he has won two interim lightweight world titles but, hand on heart, he has never truly been the best in his division. Katsidis has won 28 of his 34 fights, 23 by knockout but four of those six defeats came in his last five fights, including a defeat by WBO lightweight champion Ricky Burns at Wembley Arena in November. Like Hatton, who has suffered from alcohol and cocaine addiction and has admitted he contemplated suicide, Katsidis also has his skeletons. A decade ago, he served an eight-month stretch in jail for assault and two years ago had to deal with the death of his brother Stathis, a successful jockey. It would certainly be an entertaining fight – although also quite a risky one for Hatton as he faces a man who cites Achilles as his touchstone. “My father is from a village called Aetoraxi near to Larissa in Thessaly, the homeland of Achilles,” he told me in an interview in 2010, before Stathi’s death. “It is important I mention this because it gives the people from there so much happiness and they are my blood. Katsidis’ father was just 16 when he sailed to Australia with his mother and father, Maria and Kostantinos, to join up with his six siblings. “My father was actually working in a small country town Moree where he met my mother who is Australian. After Stathi was born, mum and dad moved up to Toowoomba to be with my Australian grandparents. “Stathi and I went to English-speaking schools and I grew up all of my life in Toowoomba which is predominantly Anglo-Saxon English-speaking people. 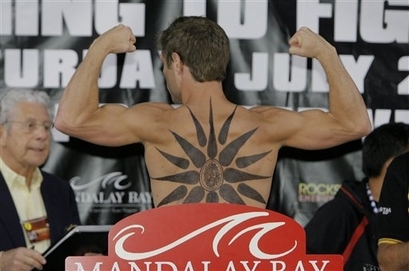 Katsidis doesn’t just wear his Greek heart on his sleeve. 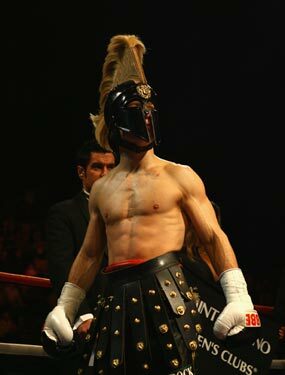 He enters the ring wearing a Spartan helmet and has a tattoo of the Vergina Sun on his back. “I feel I am fighting for my country and for my heritage, something I am very proud of. The rest doesn’t matter. No matter what culture or creed you are, it is what strength you can draw from within yourself to achieve your goals which is important. “It is inspiring that my bloodline is from the homeland of Achilles. The sun I wear on my back is that of Alexander the Great. Katsidis even draws the analogy of Achilles to mothers. “My mother told me before I left for America to be very careful,” he says. 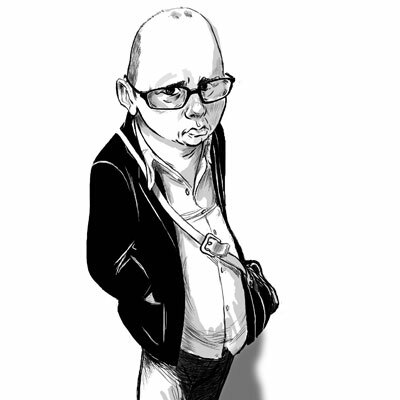 “I had a choice that I could stay home and get a job and settle down. Or I could go overseas leave everything behind and chase my dreams. Achilles mother Thetis attempted to make her boy immortal by dipping him in the sacred waters of the river Styx. But as she did so she held him by the heel, leaving one vulnerable spot in the body of Achilles. It was to prove fatal. 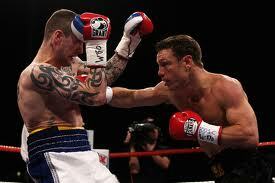 Who knows if Ricky Hatton will find Katsidis’ achilles heel – or vice versa. Athens. Friday morning. Five am. The night sky is black, no hint of dawn but already there is movement at the foot of the Acropolis. Men and women with clipboards scurry, technicians shout for gaffer tape as the arc lights slowly come on and begin to blaze across the marble flagstones. Birds, thinking they have been lamp-posted by dawn herself stretch and screech. By six, the place will be swarming. Athletes, from all parts of the world milling around waiting for the 7am start of the 30th Spartathlon, arguably the blue riband event in the world of ultra-marathoning. Some stretch, others throw exaggerated physical jerks like something out of Monty Python; some gather in groups to exchange stories of past campaigns. 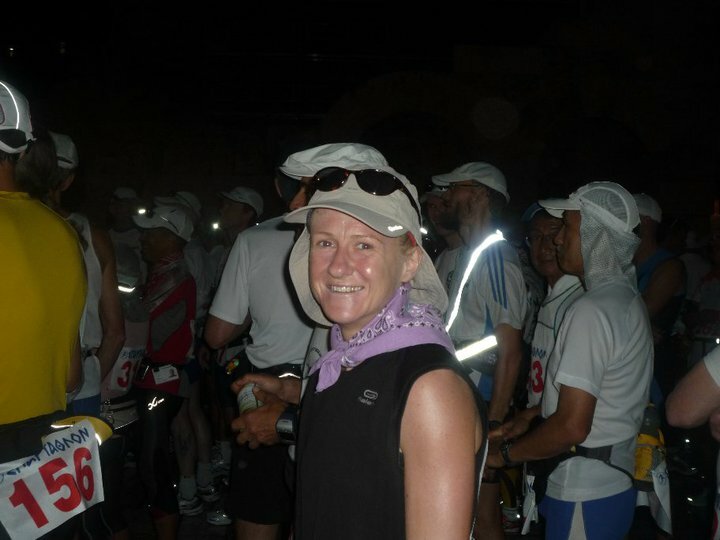 Elsewhere, runners swap cameras for the mandatory photo shoot while others will sit quietly on the ancient stones, glancing up at the crescent moon and contemplating the 246 kilometres of road and dirt path that stand between them and the finishing line in Sparta. “I had a solitary moment of calm just before the start where I sat on a bench and surveyed the scene of hundreds of excited runners about to set out on a journey that might make them or break them,” explained Welsh runner Emily Gelder, who was the first woman home in the 2010 race. You half expect to see a couple sharing a cigarette, brewing up a mug of cocoa and launching into the opening strains of Lily Marlene. Excitement, confidence, nervousness, uncertainty: each emotion picked out in the eyes and on the brow of each runner. Just like the pilots who set off before a military mission or soldiers going over the top, they all know that some will not make it. 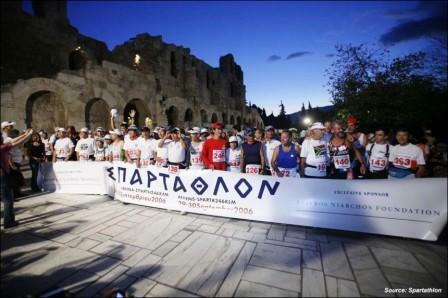 There has never been a 100 per cent completion of the Spartathlon; not even 50 per cent. Of the 330-odd starters, only around 120 will pad down the high street in Sparta and touch the toes of Leonidas before the 36-hour cut-off point – 7pm on Saturday evening. One year when the sun was blazing down, only 17 made it home, the others scattered like debris across the unforgiving hills of the Peloponnese. The weather, of course, can help and there will be some anxious glances towards the sky as dawn finally begins to impose herself. A few clouds like smears of mascara across the face of the sky, may promise some protection but there will be an underlying concern that the sun will break through. During the day, temperatures routinely top 30 degrees. At night it can drop to freezing; rain is a regular companion during the small hours, the time when the mind plays its worst tricks and the body shrieks for rest. 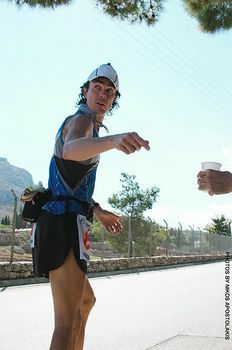 “You really do some incredible soul-searching,” three-times winner Scott Jurek told sportingreece.com after his second win in 2007. “It is like no other experience you will have as you have to go deeper into the soul and find out what one is made of. “There are times when you have to call on things like meditation. I wish I could say it’s never entered my mind to quit. Of course, I have those feelings of discomfort and pain like everyone else but those are the times when you really have to dig deep. The American Jurek and others talk of an out of body experience. Perhaps this is what Pheidippidis felt when, according to the historian Herodotus, he set off from Athens in 490BC to try and persuade the Spartans to send reinforcements to fight against the mighty Persian army of Darius I in what was to be the Battle of Marathon. Herodotus says that Pheidippidis reached Sparta the day after setting off. After some consideration the Spartans told him they could not come immediately as they had to finish off a religious festival – at which point he set off back to Athens, apparently meeting the God Pan on the way back. Did he really meet Pan or was that one of those out of body, meditative-come-hallucinogenic experiences? Emily Gelder is another who finds the long distance a zen-like experience. It was British RAF officer John Foden who, having read Herodotus wondered if it was really possible to run 246 kilometres and arrive the following day. In 1982 he put it to the test and proved that it was indeed possible. The following year the Spartathlon was born. The record for completing the difficult course is Yiannis Kouros who did it in the ridiculous time of 20 hours 25 minutes in 1984 – that is a touch over 13 kilometres an hour for 20 hours. For most, though, it is unknown territory. Their aim will be to make it within that 36-hour cut-off time. As the countdown commences, there is a silliness about the smiles. The nervous tension is brimming over…and then they are off. Waving to the bystanders and – with cheers and “good lucks” ringing in their ears – still smiling broadly, the 300 set off from the Acropolis and down towards Thisseo. From there they would snake westwards out of Athens, down to Corinth and then into the wine country of Nemea. The winner will arrive in Sparta and salute the statue of King Leonidas somewhere between 4am and 6am on Saturday but how many others will follow him home to enjoy the party later that evening? 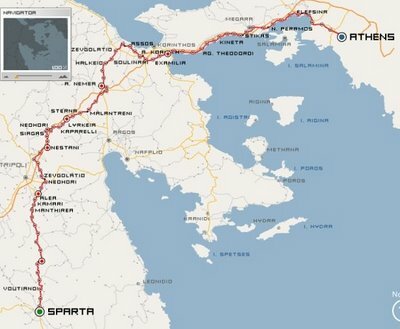 The 2012 Spartathlon begins in Athens on September 28 and ends in Sparta the following day. There may have been a small corner in the Obits pages of one of the nationals or a few lines, perhaps, in the sports pages. But I don’t live in Britain any more, or in South Africa, so I may have missed them.But it would be a profound shame if, in this year of Olympic and Paralympic nirvana, the nationals do not give over some space for Richard Norris who died at the end of August in Pretoria at the age of 80. 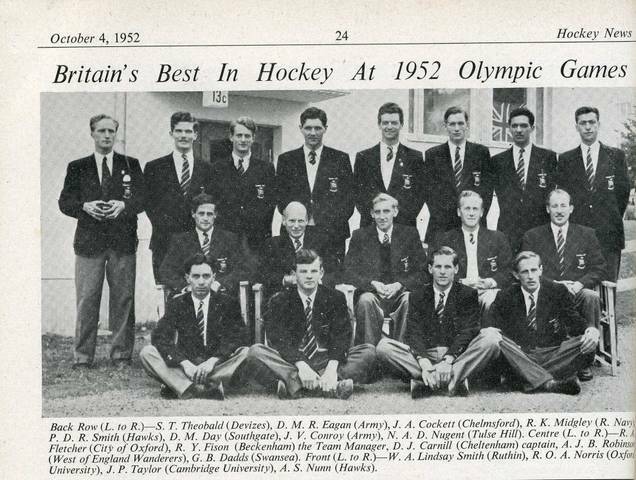 Not because he was my housemaster when I was a cadet at Pangbourne College – delightful though that thought may be – but because he was one of Britain’s finest post-war athletes, a member of the Great Britain hockey team that won the bronze medal at the Helsinki Olympics of 1952. He also played for England and Natal with considerable success. Not that we knew any of this. We always knew him as “Chaps” which I thought one of the kinder nicknames the cadets gave to the teachers, one which suggested decency and a team ethic, both of which were very much in Norris’ make-up. To us he was a housemaster, a teacher of mathematics and a bloody good hockey coach. We knew about his medal from Helsinki but he never talked about it; nor did he carry on about the other elements of his sparkling hockey career. And it wasn’t just us. “He was very modest about this and I did not know he even had an Olympic medal until I found it in a drawer when I was about 11 or 12,” says his daughter Claire. Richard Owen Alfred Norris, to give him his full beam, was born in Bombay in 1931 and grew up in India, something which according to his old Great Britain teammate Neil Nugent came in handy in the Olympics when Britain played both India and Pakistan. His father was an army man but died when Norris was just four. He later returned to England to attend King’s School Canterbury which is really where he made his name as a sportsman, representing Kent Schools in rugby, hockey and cricket as well as the Kent men’s hockey team. For good measure, he also found time to make an appearance at Junior Wimbledon. 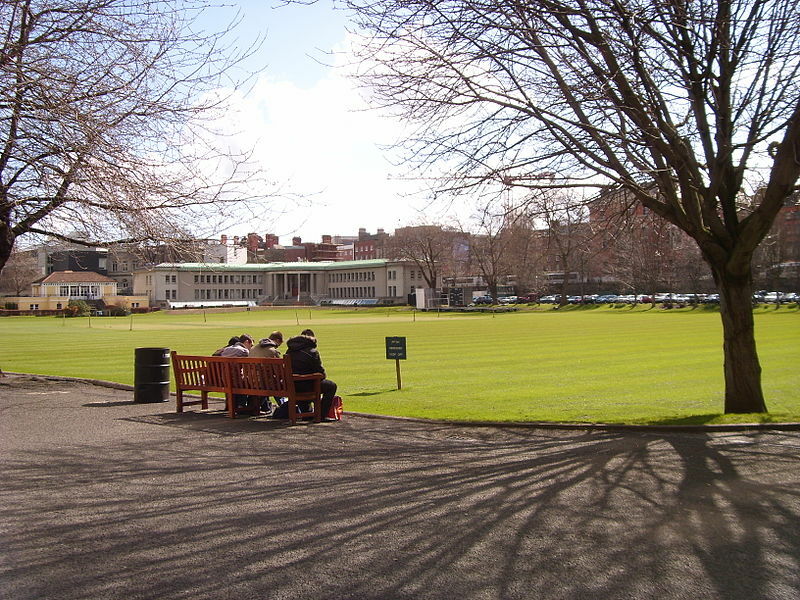 Moving to Trinity College, Oxford, where took a degree in engineering, Norris continued to excel on the hockey field winning a Blue every year he was there. Aged just 20, and before he had even played for England he was selected for Great Britain. He had an outstanding debut, scoring a hat-trick in a 5-4 victory over Netherlands in Amsterdam. He was the youngest member of the side that travelled to Helsinki for the 1952 Olympics. Norris also happened to be a very good centre-forward. “He was a splendidly built, chunky athlete; one or two people felt he was more like a rugby player,” says Nugent who was moved from centre-forward to inside forward to accommodate Norris. “He had this wonderful burst of speed and great control, the kind of stickwork that gives defenders nightmares. He was so strong down the middle and he had this tremendously powerful shot. GB beat Belgium thanks to a goal from Nugent before coming up against India, who had won gold at every Games since 1932, in the semi-final. “Unfortunately, we had two mishaps in the first ten minutes,” says Nugent. Norris scored GB’s only goal in a 3-1 defeat but they went on to beat Pakistan in the play-off for the bronze medal. Norris played five times in all for GB, missing the 1956 Games because of a cartilage operation. He also played for England between 1953 and 1959, scoring in his first six internationals and finishing with 18 goals from 17 matches – a record that bears comparison with the best in the world. His stickwork was helped perhaps by the fact he was ambidextrous, something that helped him in other sports as well. “He had an extraordinary ability to bowl left arm nippies almost as well as he did right arm,” says Ian Busby who taught alongside him at Millfied and Pangbourne. 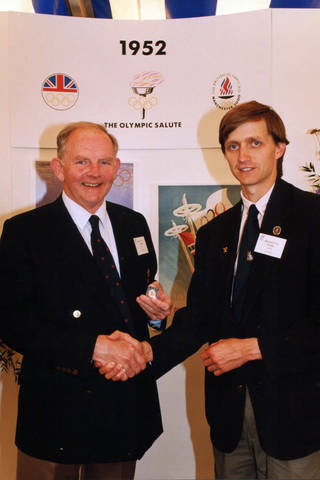 Norris with Richards Dodds, captain of the GB side that won Olympic gold in Seoul in 1988. Norris was amused some years later to discover that the orthopedic surgeon who fixed his knee was none other than Dodds. After completing his national service in the Royal Artillery – during which he was accidentally shot in the leg with a gun that his unwitting assailant did not think was loaded – he joined the Nautical College, Pangbourne, as it was then known, in 1957 as maths teacher and hockey coach.It was to be a short stay. An England hockey tour to South Africa brought him into contact with Hilton College just outside Pietermaritzburg. Recently married to Mary, he accepted their offer and moved continents. Norris continued playing for Natal inspiring them each year between 1960 and 1964 to win the South African Interprovincial tournament. That led to an invitation to play for South Africa but the English federation became rather sticky on the idea and insisted that as he had already played for England and GB, he would not be allowed to do so. He made a final appearance for Natal just before he left South Africa in 1971, at the age of 39. Next stop was Millfied in Somerset where he came into contact for the first time with Ian Busby. “I remember vividly one game against Weston, a side which then comprised half the Somerset team, when Rich bullied off, showed the ball to at least three defenders, drew the goalkeeper and ran the ball into the goal,” laughs the bearded Buzzers, no mean hockey coach himself. In 1972, he returned to Pangbourne. “He appealed in so many ways,” says Peter Points, the headmaster at the time. And a decent bottle of wine. Time for a small confession here I am afraid. As Hesperus boys we were not always the best behaved and took the notion of the wreck quite seriously. And when lights went out it was not unusual to hear the whisper of “creep” going around the dormitory. Creeps took on many forms from a simple midnight swim to carefully planned Italian Job style heists. On a couple of occasions our creep involved entering the housemaster’s wine cellar and borrowing a couple of bottles. I say borrowed because I am sure we always had the intention of replacing them although, ahem, we never did. Sorry about that. Norris was a tremendous mentor. He was amusing and forgiving but never a pushover. The boys knew where the line was and, by and large, respected it. No one complained if they were caught crossing that line. I also came into contact with him on the hockey field. I was a half decent grunter in midfield but I was not alone in being a little awestruck by Norris when he set aside his inhibitions to show us how something should be done. His stickwork was clean and rapid, his shooting power from a corner little short of nuclear. He would rattle the backboards in the blink of an eye. Needless to say, our own stickwork and finishing could be frustrating. “I can teach them how to score goals but I can’t bloody well do it for them!” was the frequent slightly high-pitched lament. 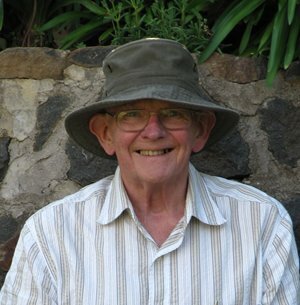 After retiring from Pangbourne in 1992, he continued to teach privately and had a mathematics textbook published by Cambridge Press before returning to South Africa in 2008 to be near Claire and their grandchildren. He returned regularly to the UK. This summer he was in Britain to hook up with some of his old teaching comrades for a reunion with the surviving members of that 1952 Olympic side. Together they attended the Olympic hockey at the Riverbank Arena on August 1st when, perhaps fittingly for Norris, Great Britain drew with South Africa. He is survived by his wife Mary and their two children Hugh, who was educated at Pangbourne, and Claire, and four grandchildren. One of the exciting aspects of this T20 Cricket World Cup is to see how it sparks interest in countries that are not recognised cricket lands. One of these is France where Eurosport is showing blanket coverage of the tournament with a French commentator accompanied by what is politely termed an ex-pat expert ie someone who understands the game and can explain the nuances and background to the French audience. This is not the first time that Eurosport has covered T20; two years ago we covered England’s victory in the West Indies and we have also locked into the Champions Trophy. The short game appeals to the French in the way that baseball does; all splash and dash and over in three hours. Perhaps the major setback is that no teams are wearing pink or pastel shades this year. I am biased because I work for them and will be working on the cricket with my French colleagues on the two tournaments over the next month but Eurosport is to be applauded, not least by the French Cricket Association which is currently in the process of shaking up their organisation and giving the game here a royal boot up the derrière. “We want to make cricket in France more French,” says the chief executive Mark Moodley. In 1989, I travelled to Paris for the bicentenary in which France beat an MCC team led by the ex England and Warwickshire bulwark John Jameson. It was a phyrric victory because in that French team that day there was a single genuine Frenchman, the remainder all Englishmen abroad. Oh, there was one Irishman as well, the captain Jack Short (left), a robust opening bat who always seemed to make runs for Ireland when touring teams visited. He was a quality player who, if he had ben playing today when the doors are wide open for Irish players to play in England, would surely have made his mark in county cricket. Jack made a cultured 73 not out that day to lead his team to a seven-wicket victory. I remember two other aspects of that game 23 years ago. One was a demonstration by a group of Tamil players who insisted they were being unfairly overlooked by the France selectors. The other was the sight of a French television crew trying to get into the thick of the action, slowly encroaching from third man to third slip, at which point they were finally shoed away by a rather irritated Jameson. In fact the MCC got a measure of revenge this year when they beat France in Thoiry, watched by former Australia captain Richie Benaud (see video below) who is now Patron of French cricket. The point is, though, that cricket was confined to the ex-pat meadows of Meudon, home of the rather stuffy Standard Athletic Club, the doors largely closed on French involvement. But that is now set to change. Moodley is an Englishman, yes, but he had been in France for some 20 years and is passionate about developing the game rather than preserving a small corner of the Empire. The national team remains a priority. This summer they were edged by Belgium in the World Cricket League Division 8 qualifiers in Spain but Moodley is looking more closely at developing the grassroots. Working closely with the ICC he has invested heavily in Kwik Cricket which is being introduced into 150 schools this year alone. The target is to reach 300 to 500 schools within three years which Moodley reckons will expose around 40,000 children to cricket. At the same time 150 teachers have been trained up on the basics of the game; within three years that figure is expected to reach 800. The association is hiring a full-time schools project coordinator and five regional development officers. It is an ambitious programme and Moodley is still looking for sponsors to help with it. So, if you happen to own a bank, insurance company, car dealership and so on, please don’t hesitate to get in touch with him. Moodley is also trying to alter the balance of the French national team so that it is made up of Frenchmen and not by ex-pats. “It is important that the young French kids who start to play the game see an achievable goal at the end of it, that is to represent their country,” says Moodley. Another avenue for any good young French players is county cricket in England. Kent in particular, given their relatively close proximity to France, are looking to use it as a scouting ground – they have already taken one French player on board. 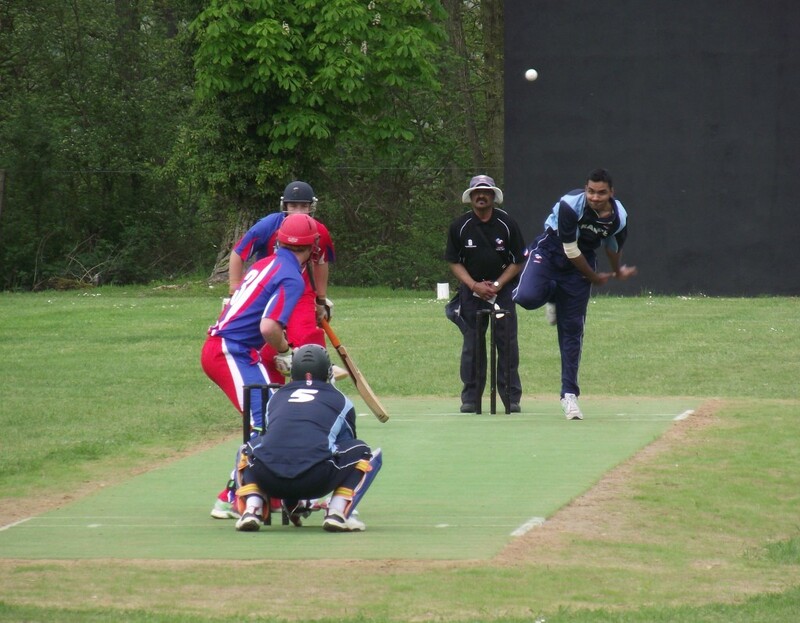 Nineteen year-old leg spinner Zika Ali has spent some time at the Kent academy and is due to return to Canterbury for further training sessions this winter. He has even benefitted from a Richie Benaud masterclass. It will take some time for French cricket to start producing quality players on a regular basis but the wheels are in motion – and at least the kids at home can tune into Eurosport and watch the big boys in action. For the Indians this was another day in the office. As such they turned up on time, did a bit of paperwork, chilled out by the water cooler, looked a bit bored at times but ultimately did their day’s work. 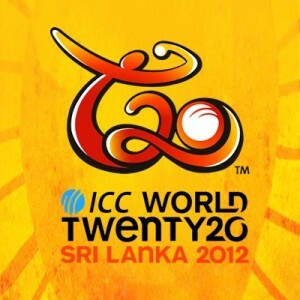 An opening victory in Colombo in their bid to win the T20 Cricket World Cup by 23 runs. Nothing spectacular but job done. Bring on England. And that is probably why most of the headlines will be about their opponents – Afghanistan. Sure they lost and they will probably lose to England on Friday but they played with such spirit and no little skill that they really did suggest that they could emerge as a serious new player in international cricket. Putting India into bat, they largely bowled with control and some guile, Shapoor Zadran being the stand-out. Their fielding, though, let them down – four dropped catches, three of them pretty straightforward meant that they had to chase 160 to win. They were never going to do it but they didn’t half give it a go. Mohammed Shahzad is not just a man who likes a decent meal – his fulsome figure a throwback to some of the Sri Lankan greats like Duleep Mendis and Arjuna Ranatunga, not to mention the former England captain Mike Gatting. He also enjoys crashing the ball to all parts and he launched the Afghan reply in fine style in spite of having a Kabul -sized bruise on his knee. When MS, as he likes to be known, pulled off a remarkable helicopter shot, its originator, the other MS, Dhoni, standing behind the stumps, did not look overly chuffed. In this case imitation was not the sincerest form of flattery. Nawraz Mangal, Karim Sadaq and especially Mohammad Nabi all looked comfortable in this company. But India have experience, guile and Yuvraj Singh – and ultimately the Afghan fell short. Even so it was a thrilling effort from them, made all the more impressive when you consider what their country has been through over the past decade and some. 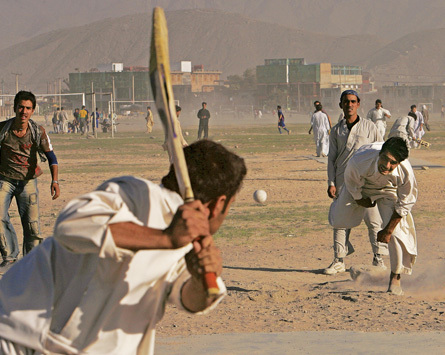 Afghanistan only set up a cricket federation in 1995 – 17 years ago – so they have a come a hell of a way in a short time, building the game in the face initially of the Taliban and latterly the American-led NATO invasion and the war that is still going on. In one way, the turmoil may even have helped the game: thousands of refugees left Afghanistan during the dark years and poured across the border into Pakistan, a country with a great passion and rich heritage for the game. Nabi was born in a refugee camp at Peshawar – that was before the Taliban during the Soviet occupation – so cricket was in his blood from the manger. And it seems that many other Afghans are in the same boat. Other federations like France and Greece must look enviously at the speed with which the game has taken off. Security problems remain in Afghanistan which means the national team hasn’t been able to host any major touring teams, although it would be great to see the Test-playing nations include a stop there in Jalalabad, for example, as a part of their Pakistan tour – as and when tours to Pakistan begin again. Apparently there are 500,000 players now in Afghanistan. It is surely only a matter of time before they scalp a top nation or two in the one-day tournaments and then – hopefully with Ireland by their side – join the ranks of Test cricket nations. You are kidding me. A bunch of supposedly grown-up men who apparently love ice hockey are going to risk the start of a new season because they cannot come to an agreement on how to divvy up….3.3 BILLION dollars. Let’s just say that again: they cannot come to an agreement on how to divvy up….3.3 BILLION dollars. …just in case you didn’t get it, that is 3.3 BILLION dollars. The clubs want more of the cake than they had before to offset rising costs while the players are hoping to hang on to what they had before – around 57 per cent, presumably the extra is the cream on top. Of course, the players don’t really risk very much at all. As with the NBA lockout last year, the door is open for players to sign for European clubs as long as the strike lasts. They still get to play and get paid. Both sides in the dispute want the support of the fans, the mugs who do actually love the game enough to spend their genuinely hard-earned money on paying for a ticket, a burger, a soda and a whole bunch of team crap, I mean memorabilia. Pittsburgh Penguins captain Sidney Crosby is one of several high-profile players who pleaded their case in a video aimed at the fans published on the internet. “As players, we understand that the people that suffer the most are the fans,” Crosby said. Right and fair in this case is how many noughts you stick on your mega-million-dollar paypacket. The club owners are just as bad, grasping for every penny, not to improve the game for the benefit of the fans or of young players or kids, but to boost their own bottom line. It is capitalism eating itself alive. The ones who will really miss out are, of course, not the high earners but the thousands of staff who earn an honest living in and around the clubs like those who work in restaurants and bars near the stadiums. Many stand to lose their jobs so that players and administrators can park an extra Porsche in the garage. It is particularly nauseous given the fact that there are many people living in the United States – not to mention other starvation-struck areas of the globe – who do have a case for earning a few nickels more, for whom it is genuinely a matter of life and death. “A Census Bureau report released Wednesday (Sept 12, 2012) provides a mixed picture of the economic well-being of U.S. households for 2011, when the unemployment rate improved to 8.9 per cent from 9.6 per cent in the previous year,” said an Associated Press report, quoted in the Huffington Post last week. “The overall poverty rate stood at 15 per cent, statistically unchanged from the 15.1 per cent in the previous year. The rate was better than a consensus estimate of demographers who had predicted, based on weak wage growth, a gain of up to half a percentage point, to levels not seen since 1965. 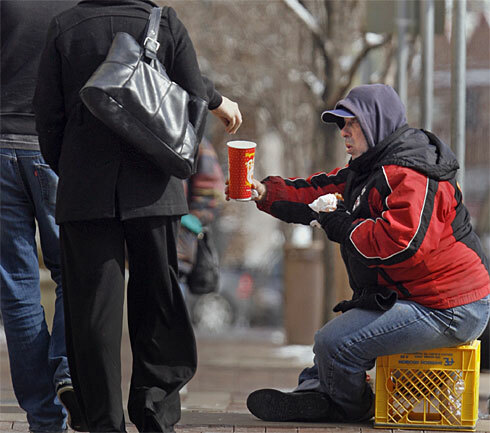 “For last year, the official poverty line was an annual income of $23,021 for a family of four. So let’s get this straight. 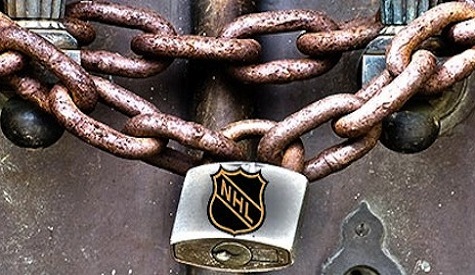 While 46.2 million people in the US alone scramble to get bread on the table, the worthies on all sides of the NHL lockout are pulling each other’s hair in a bid to grab even more of that 3.3 billion dollar cake. Get a grip on reality guys, please. Try looking at the bigger picture. You don’t deserve any sympathy from sports fans anywhere. Greed has become your master.